Devil’s Staircase Wilderness – Tour Guide Mark – Let's Go Exploring! Wow! One of my photos was selected by the National Wildlife Federation to use in their March 13, 2019 article, “Ten Big Wins For Land, Water and Wildlife.” The article celebrated the passage of the WILD ACT, which helped to create 30,000 acres of new wilderness in Oregon. 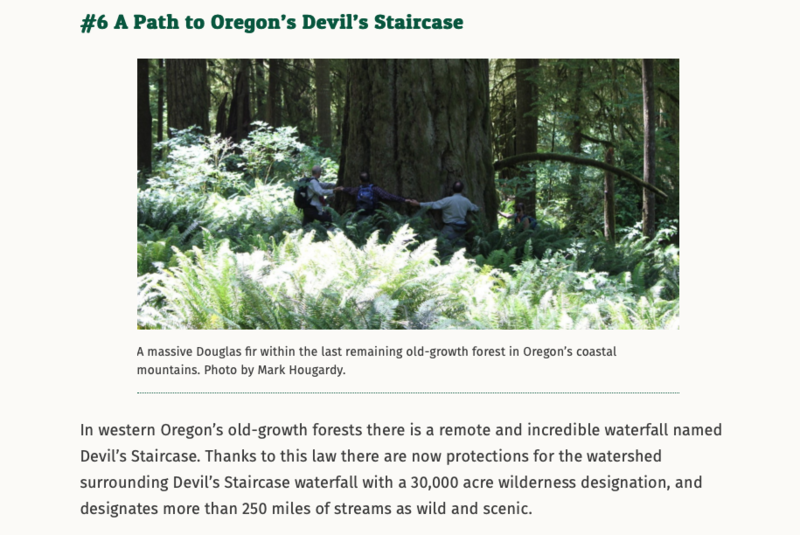 My photo was used on #6: A Path to Oregon’s Devil’s Staircase. The photo is of a Dark Grove giant from a trip I organized into the remote Devil’s Staircase area to help bring awareness to this amazing place. Here is my 2016 trip report with the image that was used in the NWF article. I’m so happy to have helped bring awareness to this beautiful area (in a small way) and to have spoken with the NWF while they were researching their article. Group: Obsidians: As this was the first visit to a very remote location, for safety, I enlisted the help of Oregon Wild to introduce us to the area. 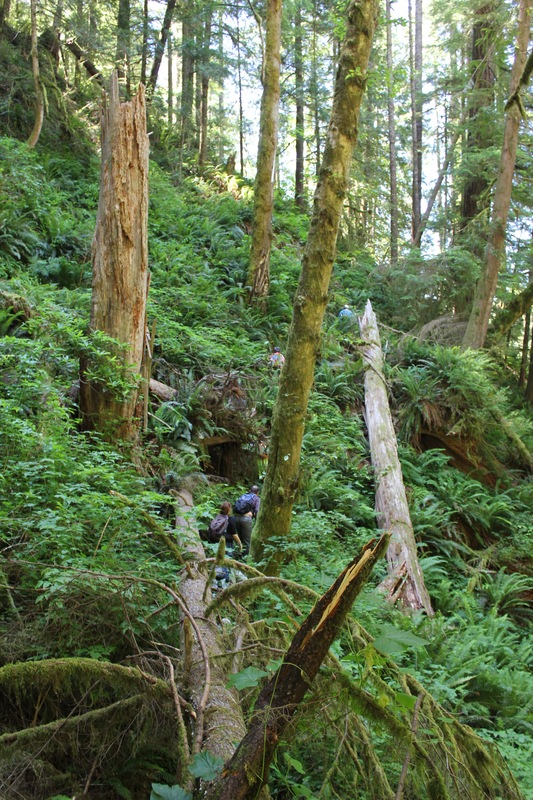 The proposed Devil’s Staircase Wilderness is one of the most remote and inaccessible regions of rainforest left in the Coast Range. This impenetrable area has limited hiking trails or roads and is visited by only a few hundred people a year. 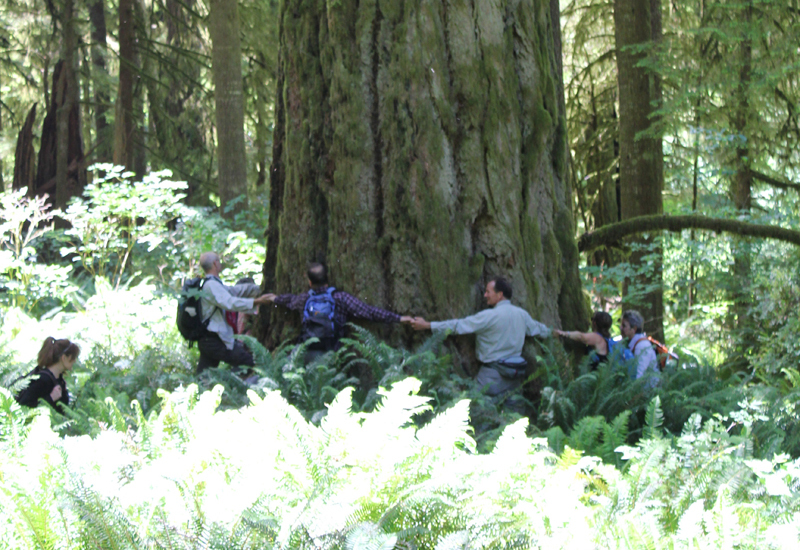 Yet it remains unprotected despite the efforts of conservation groups and Oregon’s congressional delegation. To find out more about this compelling landscape, eleven Obsidians joined Chandra LeGue, the Western Oregon Field Coordinator at Oregon Wild, for a day of hiking to the Dark Grove. The Dark Grove has never been logged and is home to ancient trees that are 400-500 years old. Our caravan of cars departed Eugene and meandered on back roads through the coast range. At one point, the green surroundings were cleaved from our sight as we drove through a wasteland of cut and darkened stumps: one member in the car likened the lifeless land to the desolated area at Mount St. Helens just after its eruption. This sight was a stark contrast to the lush biomass that we would encounter later that day. About 15 miles northeast of Reedsport, we pulled off the pavement and slowly traveled up a single laned, overgrown backroad. Salmonberries grew in abundance here and scratched the sides of the car. We parked at a junction and walked down an old logging road that was being reclaimed by the forest. Then we disappeared into the bushes, venturing down an elk trail. Posted on a tree was a sign that told us this was not the path to the Devil’s Staircase waterfall and unless you’re prepared to stay the night, and have Search and Rescue to look for you, to turn back. Fortunately, we had a guide for our inaugural visit. The so-called “trail” was on loose soil and maintained a direct angle downward at 45-50 degrees. For the next hour and a half, we carefully descended 1,000 feet. Roots frequently caught our feet as we clamored over fallen logs and beneath large trees that had crashed across ravines and splintered. Ferns grew in abundance and they and helped us balance ourselves with their solid fronds. We quickly learned that ferns were our friends. The weather that day was pleasant and sunny, though had our schedule been a day or two off, our visit might have been plagued with slippery trails. Finally, the trail leveled out and we enjoyed lunch in an amphitheater-like area of fallen logs surrounded by a carpet of greenery. We saw a shadow over the canopy as a turkey vulture circled far overhead, no doubt curious to see if the humans had lost their way. A forest of Salmonberries obstructed our path, so we made a trail straight up a ridge, then down into a forest of sword ferns. The ferns stood at five to six feet in height, so they engulfed us all and many of the shorter members traveled with their arms raised straight overhead. These tranquil glens often hid downed logs and it was easy to twist ankles or slam shins. 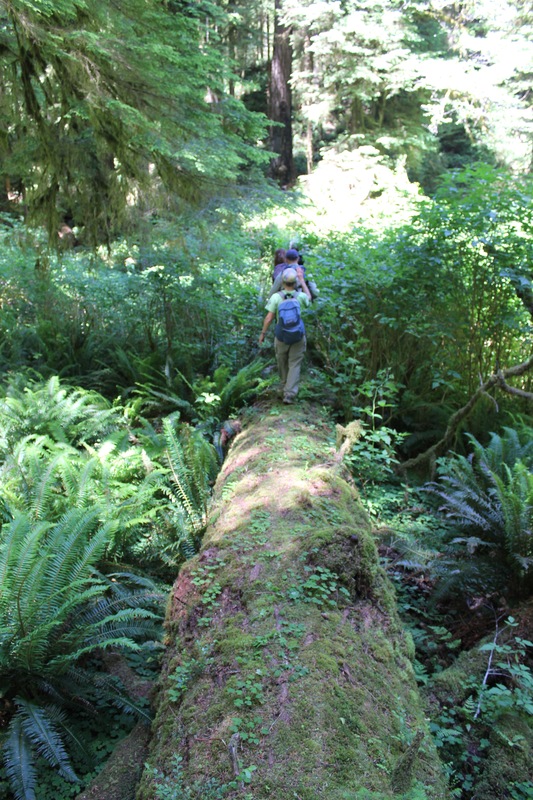 A fallen giant became our catwalk above the salmonberries, foxgloves, and ferns. We crossed a creek, but could barely see the water because of the thick undergrowth. Scampering down the side of the massive tree, we squatted and crawled through a small jungle, then emerged at the root base of the fallen giant – it was 25 feet tall! 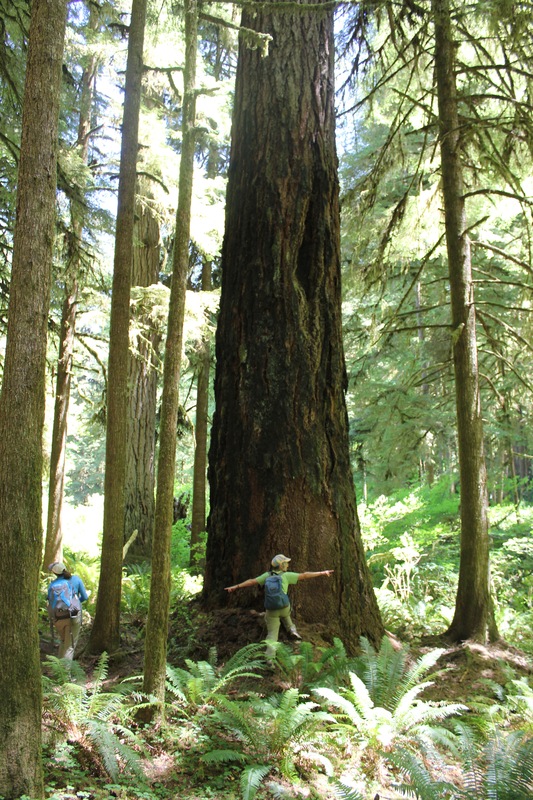 In front of us was the Dark Grove, a cathedral of 8-foot wide Douglas Fir trees. The trees were dark in appearance, the result of fire about 150 years earlier. Touching the bark a charcoal residue was imprinted on fingers. The tree model is Becky Lipton. Crossing back across the fallen giant, we stood at the base of one of the largest trees we saw that day. Eight people stood at its base, arms outstretched and hands grasped. They counted one, two, three… their calls became muffled as they rounded the opposite side…the voices returned and the loop stopped – at seven and a half people! This immense tree was somewhere between 35 to 40 feet in circumference! Several Obsidians mentioned they felt like kids in a giant outdoor playground. 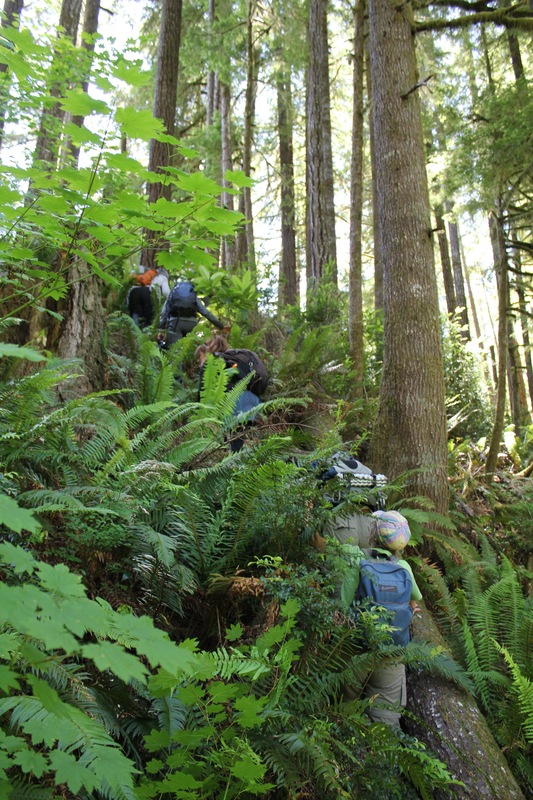 We continued through the ferns and back again along the ridge (which was unmarked on the Forest Service map). We lost the trail several times but finally found what we were looking for: a small rocky outcrop along Wasson Creek where the channeled water made a small waterfall for us to enjoy. We rested for half an hour in the sun. The rest of the afternoon was spent returning via the same trail that we had descended earlier, which was a workout! At about 4 pm, we returned to our cars and started our two-hour drive back to Eugene. This hike was a rugged and demanding off-trail experience, and all of us got scratched and dirty, some of us stung by insects, and one person had a fall (fortunately the ground was padded by an abundance of moss and there was no injury)! I understand why people get lost in this wilderness; even with directions, I could never have found this remote location. The sheer scale of the forest is very disorienting, but experiencing this place at ground level provides clarity as to why it needs to be protected.